Our range of commercial refrigeration includes multi deck and serve over refrigerated displays and counters designed for pastry products and desserts suitable for cafe's, patisserie, chocolatiers ,bakeries and retail. The commercial display counters are fully customisable to please everyone's request. Silfer Patisserie & Cake refrigerated display Quadro QPS 1500 V-D/V-SDCommercial Refrigerated Displays: Serve Over Counter Displays suitable for bakeries, pastry shops, super stores, and restaurants. If you are looking for top quality Pastry Display Cabinet which will add more value to your establishment? Cool Expert offers an extensive range of pastry display counters to choose from. Our patisserie display fridges are the ultimate combination of style and functionality and are ideal for displaying pastry and bakery products as well as confectionery, artisan and classic pies. The counters are top of the range and we pride ourselves with our competitive price on our dessert and cake display case, in the UK.Design and technology come together to create a modern range of display cabinets that furnish and enhance any setting. A complete collection to underline every detail and become the best way of showing off your precious creations. Choosing QUADRO means having a cutting-edge sales tool designed to respond to your style, efficiency and energy saving needs.Minimalist and functional design, combined with better display capacities to offer just the right appeal and space for your products. The all-glass door is a distinguishing feature of this clean and elegant line. QUADRO display cabinets come with full optionals and all the doors on this line of negative temp. display cabinets have special double glazing that prevents all condensation and misting.Technical Details Layout: or Volume 527 ltTemperature +4/+10 CHumidity +75%LED 2x2400Defrost automaticType of cooling: Ventilated and StaticShelves 6x 700x410mmExternal Dimensions: 1560x620x1213 h mm225 kgCompressor 540WTension 230V-50Hz..
Zoin Food Display Counter Porthos Lenght 200cmCommercial refrigerated serve over meat cases and pastry displays and counters, designed for cold meat and patisserie produce presentation in different food industries including butcher's , deli, pastry and more. 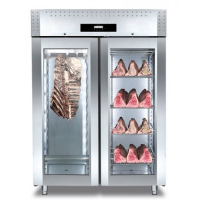 The commercial serveover fridge display counters are fully customisable to please everyone's requests.Technical Specifications Refrigerated cabinet optimal for medium size shops.L=200cmSpecifications:Temperature range : 0º|+4º CWorking plate in 304 stainless steel. Display surface made of stainless steel AISI 304. Aluminium glass frame, flat glasses opening upwards, LED lighting only on the top. Control panel with digital thermostat and defrost at intervalsThermoformed side panels in ABS. Plastic pan for the collection of defrost water to be emptied manually.Ventilated refrigeration with Potentiometer for the fansEquipped with plexiglass rear sliding doors and cataphoresis coated evaporator.Refrigerated under storage ..